The earth rotates. It has an angular momentum in the direction from the south pole to the north pole. This axis of rotation, as I explained earlier, is tilted slightly, and this is what causes seasons. The axis of rotation, in fact, does not always tilt in the same direction. This direction moves slowly around in a circle every 25,800 years. This circular motion is called precession. First, I'll explain why it precesses, and then the implications of precession. Why does the Earth precess? There are two components of precession. First, there's some angular momentum, and second, there's some torque. The angular momentum of the earth is obvious: it spins, about once a day. The source of the torque is less obvious. It comes from the Earth's equatorial bulge. The bulge is caused by the fact that at the equator, the surface of the earth moves much faster. When an object rotates quickly, what we call the centrifugal force pulls outward on the object. The earth doesn't rotate quickly enough to fling people out into space, but it does weaken gravity very slightly (by less than 1%). This causes the ground near the equator to be further from the center of the earth, making the equatorial bulge. Because of the equatorial bulge, there is more mass on the earth's equator. The sun and moon both pull on this extra mass. They pull the equator towards the ecliptic plane. If the earth weren't rotating but still had a bulge, then it would be pulled until there was no axial tilt. However, since the earth is spinning, it causes precession instead. The axial tilt doesn't disappear, but instead moves around in circles, just like a wobbling gyroscope. What are the effects of the Earth's precession? Because the angular momentum changes direction, "north" changes direction. The north star is just some lucky star that happens to be directly north at the moment. However, over thousands of years, the direction north changes such that the north star is no longer north. There are several other stars that are "north stars" at different times in the precession cycle. If you think of it from the star's point of view, the star used to point north, but then the world moved. But the world will come around again, eventually giving the star another moment. Perhaps this is symbolic of something? There is another effect: a difference between the "sidereal year" and the "tropical year". A sidereal year is the amount of time it takes for the earth to complete a full orbit. A tropical year is the amount of time it takes to complete four seasons. The precession of the earth causes the axial tilt to rotate around in a circle every 25,800 years. The direction of the tilt relative to the direction to the sun causes seasons. That means that for every 25,800 sidereal years, there will be an extra four seasons. 25800 sidereal years equals about 25801 tropical years. Our calendar uses tropical years, not sidereal years, because it is more convenient to farmers, among other people. The end result is that when we celebrate the new year, we are not celebrating a complete orbit of the earth, back to the location at the beginning of the year. We're celebrating a rather arbitrary time marker. But that's ok. I can still wish you a Happy New Year! I should also note that the positions of stars go by sidereal years, not tropical years. Since we've been using tropical years to count the last 2 millennia, the usual dates for astrological signs are actually off by about a month. Also, there's a new astrological sign in the northern hemisphere. Of course, most people never know this, probably because astrology is equally ineffective either way. There's a discussion going on at Aardvarchaeology and Respectful Insolence about skepticism and scientific consensus. Should skeptics always side with the scientific consensus? Martin and Orac agree that we should, provided that there is a sufficiently unambiguous consensus. I agree, though I would add the further qualification that this rule does not always apply to experts in their own fields. Perhaps a better qualification (as one commenter suggested) is that the scientific consensus is only the default position of skeptics. Why would we think this? Isn't it characteristically anti-skeptical to unquestioningly accept authority, scientific or otherwise? Let's first look at which sorts of people are "skeptical" of the scientific consensus. There's Global Warming deniers, Intelligent Design proponents, racists, parapsychology proponents, alternative medicine proponents, the antivaccinationists, and relativity deniers. Orac also offers an example from social science: Holocaust denial. If you deny accepted science, you're in the company of the biggest opponents of skepticism. On the other hand, we might also include major scientific revolutionaries like Einstein, Galileo, and Darwin. However, in all these cases, the revolutionaries were all experts in their fields, they started from the default position that the consensus is correct, and the scientific consensus soon came to agree with them. Relying on scientific authority is not the same as the fallacy of "argument from authority". The reason that argument from authority is fallacious is because an argument is an argument regardless of who says it. It doesn't matter if the person who makes the argument is an average Joe, a scientific expert, or the president--our acceptance or rejection of the argument ought to rest on the argument's merits, not the person's authority. However, scientific authority is different, because whenever scientists agree on a claim or argument, there is always some evidence backing them up, even if the general public cannot see it or understand it. Scientific authority comes from the fact that scientists have a much better grasp of the entire field of evidence then the public could ever hope to attain. So what is a science layman to do? Should they accept the scientific consensus, or should they avoid taking any position (leaving that up to the scientists)? I think that some people like to avoid taking any position because there is a fear of being wrong. But I would argue that it is equally wrong to take the neutral position if one of the sides is the clear winner. For example, I know very little about Global Warming aside from a lecture about Milankovitch cycles and a lecture about carbon dioxide sources and sinks. I would be wise to avoid debating the topic, but wouldn't it be wrong to avoid voting with Global Warming in mind? Just because I don't understand it does not make it less supported by evidence, or less important. One last thing worth noting is that this doesn't mean we shouldn't question science. Questioning is often a good way to learn. Forget precession for a moment. First, it's rotation explained! When you rotate a three dimensional object, it always rotates around an imaginary line that we call the "axis of rotation". If the object we rotate is a wheel, then the axis of rotation goes through the axel. If you roll a spherical ball on the ground, the axis of rotation is perpendicular to the ball's path, and goes through the ball's center. Well, if we want to know how "hard" it is to stop the object, then we need to find a certain value called "angular momentum". The angular momentum of any bit of matter is equal to its distance from the axis of rotation, times the mass, times how quickly it goes around the axis of rotation. Of course, your typical object is not a "bit" of matter, but an infinite number of bits of matter. To find the total angular momentum, we just sum up the angular momentum of all the little bits. The problem with this simplistic view is that it ignores that objects can spin in many directions. To specify the direction of rotation, we say that the angular momentum goes in the same direction as the axis of rotation. If you look in the direction of angular momentum, the object will always appear to be rotating clockwise. If you rotate a standard screw, it moves in the direction of angular momentum. What is precession? Precession is when the axis of rotation itself spins. For example, when a gyroscope wobbles, its axis of rotation is first tilted north, then east, then south, and west. Its axis of rotation continues to change directions, moving around in a circle. It is important to remember that the axis of rotation is not in itself a physical object, so we would not expect it to spin unless there was some cool physics afoot. There is. Angular momentum is just like regular motion: it does not change unless something pushes the object. In physics terms, we apply a force to the object. But force alone does not change angular momentum. For example, let's say we have a balance scale. If we push straight down on the yellow circle, the two arms are not going to start rotating. However, if we push down on one of the arms, it will start moving. The further from the center we push, the less force it takes to move the scale. The rate at which the angular momentum changes is equal to a value called "torque". Torque is equal to the amount of force times the distance from the axis of rotation. The reason it is easier to push the scale when further from the center is that it takes a smaller amount of force to create the same amount of torque. Torque, just like angular momentum, has a direction. If you apply torque, it will cause an object to change its angular momentum in the same direction as the torque you applied. Now that we know about torque, let's look at a simple wheel with an axel. One end of the axel is hanging from a string. Excuse my poor art. In case it isn't clear, the wheel is rotating in the direction of the arrow in the middle, and the string is applying a force in the direction of the arrow on the left. The angular momentum of this wheel goes to the right. Which way does the torque go? Well, if the wheel weren't spinning, then it would simply fall so that the axel is vertical. This fall would cause the wheel to spin clockwise from our point of view. Therefore, the torque is going into the page (forward, in the direction we are looking). This causes the angular momentum to move into the page. However, once the angular momentum starts going into the page, the entire wheel turns. The direction of the torque has also turned, and is now facing left. The more the wheel turns, the more the direction of the torque turns. As a result, the angular momentum will perpetually go around in circles, chasing after the torque. And that's what causes precession. Now, all of this is difficult to understand, except by resorting to math (yes, we were doing math, albeit simplified math). I can conceptually visualize special relativity, and the fourth dimension, but precession? That's hard. I believe that is the sentiment behind this comic strip from xkcd. Next time: Precession as applied to Earth! This is a fractal generated by a program written by yours truly. I like to show off. It would take a while to explain how I created this, but suffice it to say that it involves using Newton's method of approximating roots, as applied to the function f(x) = log(x2) over the complex plane. Actually, since this tree was created using a mathematical process invented by Isaac Newton, perhaps it would more appropriately be called a Newtonmas tree. See, Sir Isaac Newton, unlike Jesus, was actually born on December 25th under the Julian Calendar. As a result, some people with a bad case of hero worship like to talk about "Newtonmas". Of course, the Newtonmas tree is usually an apple tree. I know what you're thinking. You're thinking, "I want to know what the Enemy is doing this year to destroy Christmas, but I can't scan the atheist blogosphere myself lest the Devil tempt me! If only I had some sort of spy." Well... *ahem* ...I've been collecting a few, uh, links, if you know what I mean. PZ Myers and his pharynguloid minions have been celebrating "squidmas." Then he turns around and wishes us a Jolly Christmas. It's an evil conspiracy against all of us vertebrates! The Pastafarians want to return to the true meaning of Chrifsmas. You know... His Noodliness. Yes, Virginia, He exists. According to C. L. Hanson, the true meaning of Christmas isn't about consumerism or religion. Read "The Grinch and the True Meaning of Christmas" to find out what she says. Richard Wade tries to be a nice atheist this Christmas. Hilarity ensues! The "humbug" Christmas lights are so cute. This isn't from the blogosphere, but I really like this Wonderella webcomic. Is it a Christmas or a Holiday tree? Let's ask it! No More Mr. Nice Guy tells us that the War on Christmas is a myth. But he can't fool us. We all know he's trying to kill Jesus. If you look at Google Trends (via Cosmic Variance), interest in Science dips around Christmas time! Ironically, so does interest in Religion. It seems that the only victor of the War on Christmas is Shopping. But you already knew that? The British Medical Journal has a bunch of spoof articles around this time of year. Much of the media seems unable to tell the difference between science and joke science. I am reminded of the Sokal affair. This picture has been going around the blogosphere. Forget discussions about how this fits into the "War on Christmas"--instead, I'm going to use this opportunity to explain the basic science of seasons. The Earth moves around the Sun in a roughly circular orbit. The plane that includes Earth's orbit is called the ecliptic plane. While the earth is orbiting around the sun, it is also spinning around itself. When it is spinning, exactly two points on the surface, known as the north and south poles, do not move. The imaginary line going through the two poles is called the axis of rotation. Seasons are caused by the fact that the axis of rotation is not perpendicular to the ecliptic plane. If they were perpendicular, the Earth's spin and orbit would go in the exact same directions. Instead, they are off by 23.5 degrees. The axis of rotation is tilted towards the sun during summer and away from the sun during winter. Why is the Earth apparently tilted in different directions at different times of year? It is in fact tilted in the same direction all year, it's just that the direction towards the sun changes throughout the year. The day when the axis of rotation is tilted furthest away from the sun is called the winter solstice. This year, the winter solstice is December 22. The day when the axis is tilted closest towards the sun is called the summer solstice, which is somewhere around June 21 or 22. 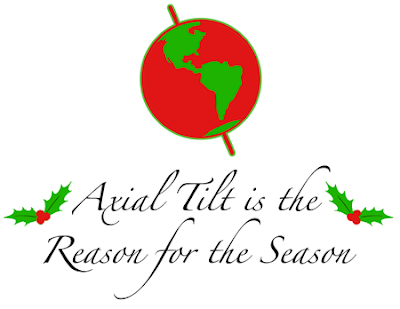 The reason axial tilt causes seasons is twofold. First, the power from the sun is not evenly distributed on the Earth's surface. If you look at the above picture, there is about an equal amount of power between each of the yellow lines. However, towards the top and bottom of the Earth, that same amount of power is spread over a larger area of Earth. Therefore, the power per unit area is smaller closer to the poles, and larger at the equator. The power peaks at the Tropic of Capricorn during the winter solstice and at the Tropic of Cancer during the summer solstice. Second, the length of the day grows shorter in winter, and longer in summer. In the above picture, you might notice that most of the tropic of cancer is in the dark. This indicates a shorter day. Also note that the entire arctic circle is completely in the dark. This indicates that it is perpetually nighttime. During the summer solstice, the arctic circle is in perpetual daylight. If you stand at the north pole, there is exactly one night and one day every year. Both the length of the day and amount of power from the sun affect the temperature and climate. Around December, the northern hemisphere has shorter days and less power from the sun. However, the southern hemisphere has longer days, and more power from the sun. The southern hemisphere has summer at the same time that we in the northern hemisphere have winter. And vice versa. The southern hemisphere, I imagine, doesn't get many white Christmases. Now, some people mistakenly think that the reason for the season is the distance from the sun. The Earth's orbit is not exactly circular, meaning that there are times of year when the Earth is closer to the sun, and times when it is further from the sun. This does have a very small effect on the climate, but it is not nearly as large as the effect of axial tilt. In fact, the day when the Earth is furthest from the sun (called the aphelion) is around July 7--in the middle of the northern hemisphere's summer. The Earth is closest to the sun (this point is called the perihelion) around January 3. So there you have it--third grade science, as explained by me. Next time, I'll talk about more advanced stuff like precession or something. Quite a while ago, I visited a local art museum. I have a better appreciation for these things after I took an art history class in the summer. However, I only studied modern art, which refers to a period from around 1770 to 1940. The most interesting part of the museum for me was the contemporary (post-modern?) art exhibit. I don't understand what is up with art these days (after WWII). What is up with it? There was some pretty cool stuff, like a creepy car sculpture. And there were also the stereotypical minimalist stuff like a blank canvas, an empty room, a glass cube. And then there's everything in-between. For example, there was a black canvas with a white rectangle in the middle, but upon closer inspection the rectangle was a detailed drawing of a house. I think the minimalist stuff is what gives modern art a bad name in the public's mind. I'm inclined to agree with the critics. I mean, maybe the first time, it was novel and all. But there are only so many blank canvases you can see before they all look the same--just one. Unless you think it has some value outside of novelty, it's more or less worthless. Oh! But here I am talking about it, which means that it must be good art! In my mind, this argument only really discredits its own premise. "Good" art does not mean "promoting discussion". Besides, if you think about it, this is just a very brief discussion of an entire category of artworks. One thing that's good about minimalist art is that after thinking, "This is art? ", my next thought is, "I should be an artist!" Behold! I call it The Net. Forget rectangles! Hypercube net silhouettes are the new deal, because I, an artist, said so! And it's not "ms paint", it's my personal style! This piece is a perfect blend of minimalism, technology, and four-dimensional geometry. Did I mention that you have to see 261 of these "paintings" before you've seen them all? Bonus points if you can identify the hypercube net in question. In fact, I'd be impressed if anyone had any clue what I'm talking about. A few days after posing a puzzle to you, I begin to tire of your complaints of hunger. "Oh fine!" I say. "I'll tell you the answer." Taking your blindfold, I place it around my own head. Your eyes slowly adjust to the light. "Observe!" I say. I divide the pennies into two groups, one of which has five pennies. I flip over every single penny among the group of five. You suddenly realize that each group is showing equal numbers of tails. When I had isolated a group of five pennies, a certain number X of those would be showing tails, and there would be 5-X showing tails in the other group. Once I flip over all the pennies in the group of five, there would be 5-X pennies that were tails-up. Therefore, no matter how I divided it up, there would always end up the same number of tails in each group. You exclaim, "I could have figured that out!" I applaud your confidence and offer to show you another "party trick". After a brief pause, you say, "Oh! I've got a call. (It's on vibrate.)" You fumble around and pull out your phone. "Really? I'll be right there!" Closing the phone, you say to me, "Sorry, I've got to go," and then you run off. I smile, and then carefully count my pennies. The Humanist Symposium #12 is up at Evanescent. It includes my post "Meaning without God". "If You Weren't an Atheist, What Would You Be?" Greta Christina's writing is always engaging. "In Pursuit of Happiness" I am happy to see libertarian views represented in this carnival. Humanism always seems so far left, as often as they deny it. "Critical Values" A brief criticism of moral relativism at Philosophy, et cetera. Today I will be considering a simple Ontological proof of God. Ontological arguments are basically attempts to prove God through concepts alone, without any real-world evidence. This particular variant has been fully discredited in modern times (and this is not just my atheist bias talking). This isn't so much an attempt to argue about God as it is an exercise in reasoning. The Ontological proof is in three steps. Definition: "God" is the greatest being imaginable. Premise: It is greater to necessarily exist than to not necessarily exist. Definition: "Drod" is the greatest video game imaginable. Definition: The "IPU" is an invisible pink unicorn that necessarily exists. Conclusion: the IPU necessarily exists. I could continue to use this argument to prove the existence of anything, as long as I define it to necessarily exist. That is absurd. Unfortunately, while the reductio ad absurdum tells us that the ontological argument cannot possibly work, it does not tell us exactly where it goes wrong. In my opinion, the central question of this argument is this: what sort of control do you have over objects when you define them? Normally, when I define something, I have full control over its properties. If I define a triangle to be a polygon with three sides, these properties must be true. There is no triangle with more than three sides, because if an object has more than three sides, it cannot be a triangle. In the spirit of critical-thinking fun, I shall attempt a similar argument going in the other direction. This isn't a serious argument, just what passes for humor in my mind. Any refutations? Premise: A being would be greater if its existence could be proven with the Ontological Argument. Premise: The Ontological Argument is impossible. After reviewing The Golden Compass and His Dark Materials, it's time for me to express my reservations about taking fiction too seriously. I hereby declare a new logical fallacy called "argument from fiction." It's common for writers to want to teach some sort of moral lesson (TVTropes has a list of these). How do you do it? Well one way is by having a character obey or disobey that lesson, and then punish or reward them based on your ideology The Truth™. This isn't the only way, but it does occur in countless fables, children's TV shows, and even in Jesus' parables. What's the problem here? The problem is that even though the fictional character was rewarded for doing good and punished for doing bad, how do we know a real character would get the same results? If it were a true story, we could at least point to the ending as empirical evidence (though, as an anecdote, it would suffer severely from selection bias). But since it's fiction, the evidence is fictional. As moving and inspirational the story might be, it is a poor way to prove anything about the real world. On the other hand, perhaps the story makes a very convincing case that it could be real. For example, take the thought experiments performed by Albert Einstein. He created fictional stories of things moving near the speed of light, and from this was able to prove deep truths about space-time. What's the difference between Einstein's thought experiments and regular old science fiction novels? I think that in general, the difference is only by degree. Some stories are simply more believable than others. For example, I find it highly improbable that Utahraptor will win the lottery, and much more believable that the boy who cried wolf would be ignored after lying so much. But you can't just say it's believable. You do not want your arguments to even resemble, "I believe it, therefore it's true." (What if it's only believable because you hope it's true?) You have to give reasoned arguments for why the outcome of the story would also be the outcome of a real situation. And if you already had reasoned arguments, what need is there for a story, except as a tool to generate interest and understanding? 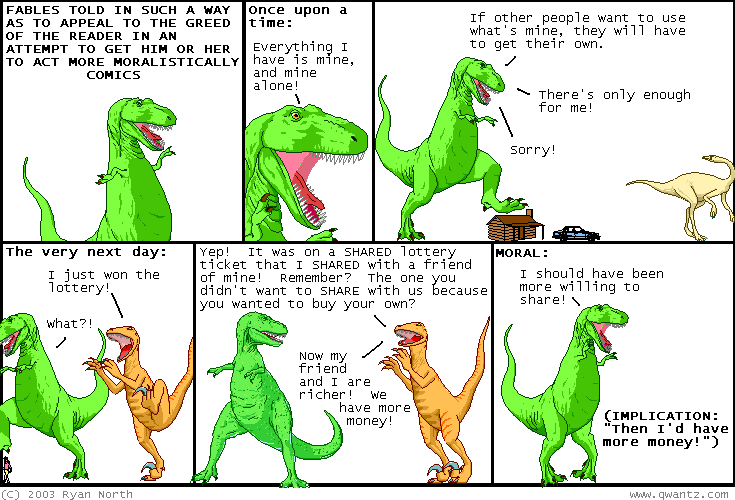 Moral: Be cautious when deriving real life lessons from fiction. Instead, we should value fictional works for what they are--stories that can be provocative, inspirational, and entertaining. I pull out a stack of pennies. I use pennies because I don't trust you. Last time, you stole a quarter. I know you did! I counted. You wonder where I got a stack of pennies, and what kind of person still carries around such worthless things. But before you can ask, I produce an ugly green and blue handkerchief and say, "Blindfold yourself." While you blink incredulously at me, I explain: "It's in the name of Reason!" I make sure to capitalize "Reason" as I speak. "Or Fun. Or Whatever Else it is that you like." After some more incredulous blinking, you finally tie the handkerchief around your head. It smells faintly of skepticism. You hear the clatter of a stack of pennies being scattered on the table. I say, reassuringly, "Preliminary tests suggest that this is a fun 'party trick,' as they call it." I make quote motions with my fingers as I say "party trick," but you can't see them, which is why I need to type out what I'm doing. You wonder why it is that you are performing the party trick and not I.
I boldly declare, "There are five tails showing among the pennies on the table! Your task is to sort all of the pennies into two groups, each group showing an equal number of tails!" I ignore your incredulous blinking, almost as if I could not see through your blindfold. After a bit of hesitation, you pick up a penny, and try to feel whether it is heads or tails. "No!" I shout, surprisingly close to your ears. "There is an easier way, without tricks! Think!" You start to mumble that you feel uncomfortable, but I cut you off with another, "Think!" I go on to reassure you, "If you can't figure it out, don't worry. You'll only be doomed to blindly flip and sort coins until I post the solution in a few days." Are you unable to solve the puzzle? Turn to page 2. Do you solve the puzzle? Turn to the comments section and choose your own adventure. Cosmic Variance explains some of the more confusing details of dark energy. I know at least one of my readers likes to jump ahead to this complicated stuff, so there you go. While I'm at it, I might as well link their Arrow of Time FAQ. For reasons that will remain unexplained, I've been watching a Japanese show about a physicist who solves crimes using his amazing physicist abilities. The physicist sometimes fulfills the scientist stereotype, and sometimes subverts it. For example, in one episode, another protagonist tells him that he is more interested in numbers than people. Later, the physicist explains that scientists have a dull life (what!?) and seldom meet people, but are not anti-social. I appreciate the effort to humanize scientists, but the characterization is still false, at least in my experience. I've found that scientists in fact meet lots of people. We basically deal with information and knowledge, so we must perpetually be in contact with other people. I only do a small amount of research, but I still need to meet once a week. The rest of the week, I make-do with lots of e-mails. Secondly, scientists do not spend most of their time in a dim lab repeating the same experiment over and over. Relatively little time is spent in lab--much more time is spent analyzing the results of experiments than actually performing them. In fact, scientists get to travel a lot. They often go to science conferences, which are all over the world. My professor goes to several of these a year. He also travels to see nearly every solar eclipse, and travels to set up or check on magnetometers, which are placed all over the world. Indeed, traveling is so important to science that it is a force for peace between nations. Go science! This is the second half of my discussion of the trilogy His Dark Materials. See my post on The Golden Compass. I do not want to put off anyone from reading this trilogy. The last two books, The Subtle Knife and The Amber Spyglass, are much less subtle than The Golden Compass, but the trilogy remains highly imaginative, enjoyable regardless of what you think of religion. I mean, I don't even completely agree with them myself. Also, I would like to put to rest a popular misconception about these books. No, they do not kill God. If you didn't know that, I recommend skipping my spoilers and reading the trilogy instead. The Church adopts a much more sinister quality as compared to the first book. For example, one character performs "preemptive penance," which absolves him of future sins, allowing him to be an assassin. It also turns out that the Church is simply a pawn of the Authority, who controls churches in all the parallel worlds. The Authority, by the way, is not God, but the oldest angel, who had claimed to be God. The Authority is senile, and actually lets another angel, Metatron, rule for him. Metatron is a tyrant dictator, and the biggest antagonist of the series. I can't help but think that Authority and Metatron are supposed to be symbolic of moderate and extremist religion respectively, for their story echoes the common freethinker sentiment that moderates "enable" extremists. You often hear that Pullman killed God in this trilogy, but that's completely false. Technically, they only killed Metatron, the Regent of an angel that falsely claims to be God. I totally missed it when I read it, but apparently the Authority also died. He died unspectacularly, simply dissipating in the wind. The missability of the Authority's death is Pullman's way of belittling the fraud. After defeating Metatron, Pullman sets up what he calls the "Republic of Heaven" as opposed to the "Kingdom of Heaven." Pullman is not destroying heaven, but improving upon it. Pullman seems to think that religion has unfairly monopolized heaven, spirituality, and whatnot. He thinks religion, just like the Authority, is a fraud claiming to be divine. The stories strongly suggest that there is something truly divine, but Church is not it. In my opinion, the real God in this trilogy is Dust itself. Pullman adds a lot more creatures, each of which is not only interesting in its own right, but is also designed to further describe Dust. Spectres are evil creatures that eat Dust, leaving pure apathy in their wake. Angels are beings made of condensed Dust, but not blessed with material bodies (more rebuttal to C. S. Lewis' "hatred of the physical world"). [Interestingly, Pullman inserted a gay angel couple, which I'm sure upsets many conservative Christians.] The Mulefa are creatures that evolved to roll on wheels (a detailed explanation followed). When the Mulefa found a way to access Dust, they became conscious and gained a permanent collective memory. Yes, Dust pretty much makes up all that is good in the world. The anti-religious themes don't stop there. In their adventures, Lyra ends up destroying the afterlife, which it turns out was hardly paradise. It's a not-so-subtle attempt to argue that the materialist view of the afterlife is actually better. Later, Lyra reenacts the Adam and Eve story and then... There was more blatant allegory, but I forget the rest. But like the first book, there's a lot more to the themes than just regular old anti-religion. For example, there is one character from our world who discovers Dust not through theology, but through particle physics. She finds what she calls "Shadow Particles" (aka Dust) that seem to hang out only around humans and human-designed objects. It acts as if it were conscious. However, her discoveries are so unbelievable that she loses funding. If this book is critical of religion, it's critical of science as well. It asks us, could science ever prove God? So I've been calling all these themes "anti-religious", but is that what they are really? Are they anti-religious, anti-dogma, anti-Christian, anti-God, or what? I would say The Golden Compass is mostly anti-dogma (which is only anti-Christian if you think Christianity is all about dogma), but these books are arguably much stronger. Before, the Church was just misguided, and would justify evil acts with close-minded ideals. Now, the entire belief system of the church turns out to be a sham. It's still anti-dogmatic, but it also suggestively connects dogma and nearly all of organized religion. Whether that means that Christians are justified in boycotting the movie... well, I'll let the reader decide that one. On December 7, The Golden Compass movie is coming out. The atheist blogosphere has seriously been abuzz about this for months. Why? Because The Golden Compass, first in the trilogy called His Dark Materials, is *gasp* anti-Christian! Or so the many boycotting groups say. See, the author, Philip Pullman is *gasp* an atheist, and hates Christianity, The Chronicles of Narnia, and probably babies too. Never mind that the movie will dilute all such themes into nothingness--it will end up boosting book sales! I could probably insert an analogy to homeopathy in there. These worries do have some foundation. Take a look at some of these Philip Pullman quotes. So I'm caught between the words 'atheistic' and 'agnostic'. I've got no evidence whatever for believing in a God. But I know that all the things I do know are very small compared with the things that I don't know. So maybe there is a God out there. All I know is that if there is, he hasn't shown himself on earth. When you look at organized religion of whatever sort – whether it's Christianity in all its variants, or whether it's Islam or some forms of extreme Hinduism – wherever you see organized religion and priesthoods and power, you see cruelty and tyranny and repression. It's almost a universal law. I didn't read the whole of Narnia as a boy: I read The Voyage of the Dawn Treader, and felt slightly queasy, as if I were being pressured to agree to something I wasn't sure of. Narnia has always seemed to me to be marked by a hatred of the physical world. What I say to people who criticize me for attacking their religion... is simply this: what qualities in human beings does the story celebrate and what qualities does it condemn? And an honest reading of the story would have to admit that the qualities that the stories celebrates and praises are those of love, kindness, tolerance, courage, open-heartedness, and the qualities that the stories condemns are: cruelty, intolerance, zealotry, fanaticism... well, who could quarrel with that? I don't know anything about the movie, but I do know about the books. As it happens, I read the entire trilogy just last year. I highly recommend the first book, The Golden Compass. It has a tremendous amount of depth, a terrific plot, and makes for great reading even for adults. The other two books, I didn't like as much, since they sacrificed plot quality for stronger themes, but they're still good too. Let's dive into the details of what might be considered anti-religious about the first book. If you don't want to read spoilers, the conclusion is that the major theme is not so much anti-religious as it is anti-dogmatic. Also, this is just one of many themes, most of which do not directly touch on religion. The Golden Compass occurs in a parallel world. In this world, theology and science are one and the same. The main political power is the Church (also called the Magisterium), which is actually composed of a bunch of rivaling groups. The Church is portrayed as a sort of corrupt organization that tends to suppress "heretical" research. The message here isn't so much anti-religious as it is anti-dogma. After all, in this world, theology plays the role of science, providing technology for the world. It's not that theology is wrong, it's that their rigid beliefs become a barrier to progress. But I don't think the characterization of the Church is the real meat of what's anti-religious in this book. The biggest theme in this book is all about growing up. Pullman is using this as a rebuttal to Chronicles of Narnia, which in his mind, seems to glorify children and demonize growing up. In particular, Pullman was unhappy about a certain part of Narnia in which one of the characters became "too keen on being grown up" (she was interested in lipstick, boys, etc), and essentially lost salvation. Also, at the end, the children died, as if C. S. Lewis wanted them to forever stay innocent rather than have them grow up to do good in the world as adults. Pullman thought this was just terrible, as if C. S. Lewis hated the physical world (see quote above). In the world of The Golden Compass, there is a precise moment when children suddenly become grownups--when their daemons (souls, in the form of talking animals) can no longer shapeshift, and settle on a single animal form. To Lyra, the protagonist, this seems scary at first, since she likes her daemon to be able to shapeshift. But it turns out that growing up is a good thing. When they grow up, a kind of particle called "Dust" gravitates towards them. Dust is basically (spoiler alert!) original sin, or at least the Church thinks so. In their version of Adam and Eve, the daemons of Adam and Eve stopped changing shape after they ate from the Tree of Knowledge. The Church mostly tries to suppress all knowledge of Dust. However, one part of the Church, headed by the charismatic and deceptive Mrs. Coulter, tries to actually do something about Dust. She kidnaps children, and brings them to a facility where they are severed from their daemons (which is like severing their souls). If the children even survive, they do indeed lose Dust, but also develop a mindless, apathetic quality. Pullman clearly considers original sin a good thing. It is the knowledge of good and evil. It confers a higher level of consciousness, a freedom of choice, and a feeling of love. It's what allows armored polar bears to talk, think, and be all-around awesome. But again, this theme is more anti-dogma than it is anti-religion. Pullman's complaint about religion is that in its misguided quest for purity, it tends to reject knowledge, freedom, and love. It seems strange to me that so many people have a problem with this. Are they pro-dogma? They're overreacting. You don't see me complaining about the whole thing with the souls. I wrote more, but it went on too long. See Anti-religious themes in His Dark Materials (there will be more spoilers). The nosy among you might notice that I switched out statcounter for sitemeter. In between, I had briefly tried Google Analytics, but it wasn't capable of blocking my own visits, which totally killed it for me. Statcounter was cool, but it had a 500 log limit. Hopefully, sitemeter won't have any problems. Getting statistics was definitely the most enlightening and addicting part of starting a blog. I feel like Zeno, obsessively checking visitors' referring links. I thought at first that I'd be happy with an F-list blog with maybe one visit a week, but no! I want more power! Mwahaha! But once I get onto the C-list B-list, I'll be satisfied. Right. I mentioned yesterday that in a normal wire (copper, 1 mm diameter), a current of 10 amps corresponds to an average electron velocity of about 3.3*10-5 meters per second. To compare, I'd guess that the velocity from thermal energy is around 103 meters per second (within a factor of 10 or so). The only reason the thermal energy doesn't come into play is because it makes the electrons move in random directions, both forwards and backwards. All but the tiniest amount of velocity gets canceled out. The reason the number must be so tiny is that when there are around 1023 of these electrons moving around, a tiny average velocity corresponds to a large overall current. This post is in response to a question from a reader. Ask and you shall receive. Also, correct my math, because I regularly make mistakes. There is another dramatic success of Special Relativity that is virtually unknown among laymen. Special Relativity is what causes magnetism. First, what is the electrostatic force, and what is the magnetic force? The electrostatic force is what causes opposite charges to attract, and like charges to repel. Electrons, negatively charged, tend to stick to protons, positively charged. Two protons would repel each other, as would two electrons. On a macroscopic scale, the electrostatic force is what causes static electricity, in which an object accumulates an excess or shortage of electrons. It also causes lightning, which is basically static electricity on an even larger scale. The magnetic force acts upon moving charges. If I've got an electric current, where the electrons are moving forward in a wire, the current creates a magnetic field. If I place two of these wires next to each other with the currents going in the same direction, they will attract. If the currents go in opposite directions, the wires repel. What we call magnets are materials with permanent circular currents on an atomic scale. The north pole of a magnet has currents going counter-clockwise, and the south pole has currents going clockwise. The north and south poles attract because when they are placed together, the currents go in the same direction. The magnetic and electric forces interact and affect each other, but it is not clear why. Why should currents in the same direction attract? The wires, after all, have no net charge. There are just as many electrons as protons in each wire. So it can't be that the electric force is somehow sneaking in, disguised, right? There is, in fact, a paradox associated with magnetism. Magnetic forces only act upon moving charges. But if we consider a moving particle's reference frame, the particle always has zero speed relative to itself. Therefore, from the particle's reference frame, it cannot be affected by magnetic forces. These forces shouldn't be disappearing just because our reference frame is different! Let's consider a specific case: two wires with current going in the same direction. Wires, along with most everyday objects, consist of equal numbers of protons and electrons. If a wire has electric current going through it, that means that the protons are remaining still while the electrons are moving in one direction along the wire. The electrons, in fact, are moving at a large range of speeds, but for simplicity's sake I will assume that they are all moving at one constant speed. Let's consider the wires with Relativity in mind. Of course, from the protons' motionless frame of reference, the wire is electrically neutral. But what happens if we consider the frame of reference of a moving electron? From the electron's point of view, the other wire contains a bunch of motionless electrons and a bunch of backwards-moving protons. Since the electrons and protons are moving relative to each other, we must take into account Lorentz contraction. If you don't recall, Lorentz contraction makes all distances in the direction of motion smaller. Lorentz contraction causes the protons to be closer together, more densely packed. As a result, the other wire has an overall positive charge, creating an electrostatic force. The electron will be attracted by this force. So from my point of view, standing still, the wires attract because of magnetic forces. From the electron's point of view, they attract because electric forces. Both of us are correct, much in the same way that we would both be correct in thinking the other's clock ticks slower than our own. The resolution to the paradox is that electrostatic and magnetic forces transform into each other as we change reference frames. It turns out that magnetism is necessary for Special Relativity and electrostatics to make any sense together. What's interesting about this is that it occurs at extremely low velocities. I did a bit of math, and I found that if we have 10 amps (a quantity of current) going through a copper wire of diameter 1mm, then the average velocity of electrons is 9.4*10-5 [edit: corrected math] 3.3*10-5 meters per second. That doesn't even begin to approach the speed of light (3*108 meters per second). And yet, if you place two of these wires next to each other, there will actually be a measurable magnetic force. Not a significant force (about the weight of a paperclip per foot of wire), but not negligible either. We rely on this force for electric motors, generators, and countless other applications. Usually, when you learn Special Relativity, teachers are quick to say that it is entirely ignorable at everyday speeds. But it turns out that even at microscopic speeds, Relativity does no less than power the modern age. I've decided add a difficulty rating to all my puzzle posts. It is on a scale from 1 to 10, where difficulty 1 means it is more of a demonstration than a challenge, and difficulty 10 means it would stump puzzlers greater than me. Most of the puzzles I've done so far are on the easy end of the scale. I'll probably keep it that way until they get a bigger response. If you disagree with any of the ratings, feel free to say so. Oh, and I am not oblivious to the fact that most people do not like puzzles. Lurkers! You cannot hide from me. I know you've been skipping over my puzzle posts. I've had enough experience with puzzling to know that most people simply don't care about this stuff, and refuse to even think about it. Unless I devote my entire blog to puzzling (not likely! ), I will forever have readers that skip over the puzzle stuff. On the other hand, people apparently perform many google searches for these puzzles (the brick puzzle in particular). I suspect that they're just looking for solutions so they don't have to think about it anymore. I know this has been proven to be a futile effort, but I'd like to ask my readers a question. Do puzzles bore you? Is there any kind of puzzle that interests you? I am curious. An all-too-common complaint about atheism is that it leaves a life without meaning. This is trivially false—you don’t have to meet many atheists before finding that most have found profound meaning in their lives. It is troubling to me that some people think that God is the only possible meaning of life. Even more troubling is the thought that some atheists might agree. Life does have meaning, and it is important! We are alone in an uncaring universe. On the cosmic scale, we are even less than a pale blue dot, since, outside of a tiny region in just one of the billions of galaxies, we are too small to see. Our lives are much too short to see much more than a snapshot in the cosmic, geological, and evolutionary timescales. There is no consciousness hiding behind the cosmos, no greater being to love us. The universe had no purpose in mind when it created us, indeed it has no mind at all. But just because the universe is uncaring doesn’t mean we have to be. We may be invisible from just a few light-years away, but we’re not a few light-years away—we’re right here. Our lives may be too short to see the universe unfold, but it is not too short to have plenty of experiences that are meaningful to us. There is no reason to identify with the universe’s apathy—we are not the universe. Unlike the universe, we have a mind and purpose. When I say we have a purpose, I don't mean that there is an absolute purpose handed to us from above. We create our own purpose. This is true whether you believe in God or not. If God exists, you must still choose: is your purpose to do God's will, or to rebel against his will? The choice may be obvious, but it is you who chooses, not God. And that is not the only choice you make. Do you want to see the world? Help others? Develop talents? Better society? Make friendships? For the atheist, these choices remain the same. The only difference is that instead of choosing whether to do God's will, you choose whether to do good. This choice is equally obvious. After all, the only reason that doing God's will is obvious is because "God's will" is just a stand-in for what's good. In the endgame, the Earth will burn up. Whatever good or bad humanity did would only cause an unnoticeable, irrelevant difference in the chemical make-up of the Earth. The universe will steadily continue on towards its death. Our souls will have long disappeared with our bodies rather than travel to any sort of afterlife realm. There is nothing to look forward to in the distant future. But why should we look so far in the future? If nothing that far in the future matters, then our only choice is to care about the present and near future. The present—your life, right now—is important. And since we care about others as well, this is reason to care about what happens to humanity after our own deaths. If there is no afterlife in the end, what is the incentive to help others at our own expense? Well, if you're acquainted with game theory, you know that helping others often results in your own benefit in the long run. If you're acquainted with the theory of evolution, you know that social creatures like ourselves adapt by coming to want to help others. If you're acquainted with friendship, you know that helping others is its own reward. My preferred reason is because helping others is, well, helpful to others. It's not for me, it's for them. Aren't they reason enough? 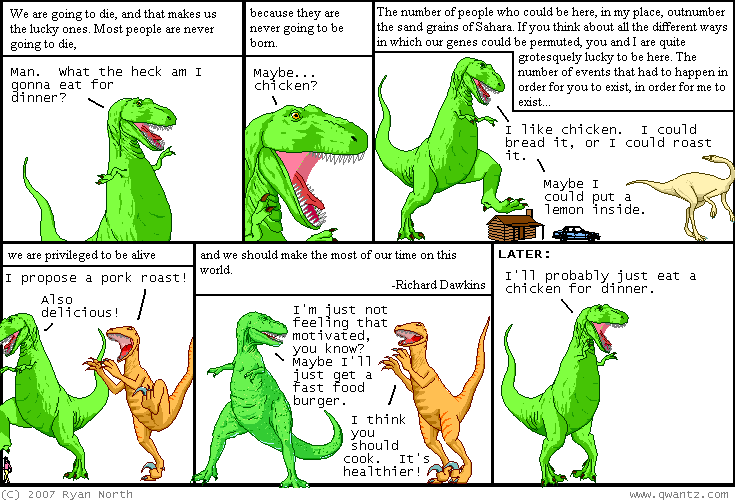 On the lighter side, it's a juxtaposition of Dawkins and dinosaurs, as presented by Dinosaur Comics! Enjoy life!